It’s all about bridesmaid dresses for today’s From Blogger to Bride! One of the smaller aspects of the wedding planning process, but definitely not the least stressful! You want your bridal party to feel great and have a fun time at your wedding, and mixing a large group of personalities, styles, and body types together can make this an overwhelming task. Today, I have Weddington Way to give us the low down on bridesmaid dress styles, etiquette, and more! 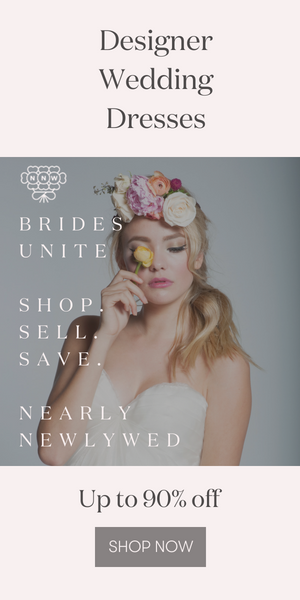 Weddington Way is the leader in offering bridal parties a collaborative shopping experience, so they know a thing or two about how to choose your bridesmaid dresses! What styles are popular this season for bridal party wear? Mix & Match is still a major trend that we’ve seen consistently dominate. However, what we’re noticing now that’s different than the past is the mixture across fabrications. It is why we’ve developed both the Dove & Dahlia and Weddington Way collections! Both brands allow parties to have the same pantone color across different styles so that brides can let their bridesmaids choose from different fabrics/styles/prices while still hitting her aesthetic/palette. This season, we’ve noticed that the color purple has had a renaissance in popularity. It’s perfect for any season and looks great on all skin tones! Country star and One Tree Hill alum Jana Kramer just got married last month and her five bridesmaids all wore our exclusive Dove & Dahlia Charlotte Dress in French Lilac! How can you ensure that all of your bridesmaids are happy with their dresses? Let them choose what works best on their body! Mix & Match is great because it gives bridesmaids free reign to choose the styles that are the most individually flattering. A major advantage to this trend is that bridesmaids will select dresses they can (and will) actually wear again for other occasions. Happy bridesmaids = better pictures = happy bride! What advice do you have for bridesmaids who are unhappy with their dresses? Get it tailored! It may be her big day, but the better you feel, the better bridesmaid you will be! Sometimes all you need is a quick alteration to get the dress fitting perfectly. Is there etiquette a bride needs to follow when she begins selecting bridal party outfits? For example, is there a rule to follow when it comes to dress pricing? It’s best to follow the lead of the members of your party and take into consideration their individual budgets and the total amount they’re spending to be a part of your wedding (which can add up!). What additional advice, if any, do you have for brides who are about to begin choosing their bridal party outfits? In summary, give your maids options and be conscientious of price! *Junebug Tip: It’s best to have dresses ordered 6 months out from your wedding day. It can take up to 4-5 months for dresses to be delivered and even then your bridesmaids may need to have alterations done. For my bridesmaids, I sent out a 4 month timeline as well as a rough wedding day itinerary to keep them in the loop! I want them to feel involved and aware of what’s going on and how they can contribute. Luckily, I have some awesome bridesmaids who are helping so much and are on top of getting their dresses ordered and travel arrangements in place. I’d like to think that me keeping them updated and in the know helped them understand what was expected of them and what deadlines they needed to meet for certain things. So, if you just got engaged and are about to select your bridal party, keep in mind that their behavior is totally dependent on how you treat them! Let them choose dresses that work for them, keep them in the loop, and give them tons of opportunities to help (but don’t expect them to!). Next time on From Blogger to Bride, I’m talking bachelorette parties (as mine is right around the corner) and how to do them right! Stay tuned and happy wedding planning! Oh, I just loved all your pictures. I think my favorite was the bride showing of her dress to all of her lovely bridesmaids. What a breathtaking wedding. These photography are looking very attractive and colorful . I also like such photos. wonderful post i like it. Today’s world is personality.If it is good then everything is good.People recognize us after see our clothes so we should better dress-up. please show me new stylish women clothes.Thanks for sharing. Their colorful dresses are looks exceptional .